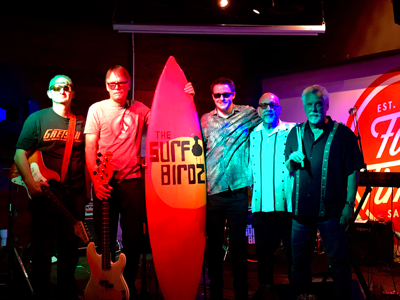 We are a '60s Surf Rock band based out of San Diego and have played all over San Diego at different venues and events since 2014. Lead Guitarist Nick "Spartacus" Dimolios first picked up the guitar and learned to play by ear at age 14 by listening to the greats. Later, he studied classical guitar and music theory at Grossmont College and has played in local bands ever since such as Acme Blues Band, Uncle Bob and the Earthmovers, Cathie and the Comets, and Two Wheeler Squealer. Classically trained keyboardist and vocalist Jackson Hines, grew up in San Diego playing the piano and the trumpet and studing music theory from an early age. Drummer Gary "G$" Peña was on his paper route as a young kid when he was asked to join a neighborhood band as their drummer. He spent all the money he earned on his first drum set. Later, he played the same stage as Savoy Brown and Iron Butterfly, whilst playing for local legends The Insights and Lobster's Blues Band, as well as starring Vegas acts.